Christian holidays are more than just times for families to get together they are significant because they have the potential of changing lives. At Christmas we celebrate through the giving of gifts, family dinners, worship services, festive decoration, and Christian decorations. But Christmas is more than that. For Easter our celebrations begin with Lent, then we worship on Palm Sunday, then we worship on Maundy Thursday, then we worship on Good Friday, then on Easter Sunday we begin with Sunrise worship services, Sunrise breakfast, then later we worship one last time where we see people we rarely every see in church and everyone displays their new spring wardrobe. And somewhere sandwiched in on our Easter Sunday Worship on behalf of the Easter Bunny we hide Easter Eggs and give children Easter Baskets. Easter is more than just remembering and celebrating Jesus’ sacrifice for us! Easter is more than just celebrating God’s ultimate gift of eternal life! Easter is about transforming our lives in the here and now! Easter is about journeying down a new road! Easter is about the dying of our flesh and the resurrection of our spiritual lives! Easter is about the coming of age of God’s kingdom in our lives! Easter is about Jesus’ life in you! Easter is about taking the things of this life and giving them eternal significance! John identified Jesus as the person Pilate handed over to be crucified. But guess what? Life has handed you over to be crucified as well! But before going further allow me to turn back the pages of history because before the actual crucifixion the crucifixion of Jesus began not on Golgotha but in the hearts of those Jesus offered peace and eternal life. “We and our own families will take the blame for his death!” I wonder if while receiving the death by crucifixion sentence Jesus was silently praying, “Father, forgive them for they don’t know what they’re doing.” I wonder if God was listening. When I was a young lad many years ago my mom told me when we do things that are bad the wounds in Jesus’ hands, feet, and side hurt all over again. If that is the case over the course of my life I have caused Jesus a great deal of pain. I wonder what he’ll say to me when we finally meet face to face. Care to guess? If you have seen the movie “The Passion of the Christ” you will have witnessed a VERY REAL depiction of the beating that was inflicted on Jesus. I remember each time the flogging devices would wail into his back I would cringe. Each time I saw the satisfaction on the faces of the Roman Soldiers when a new wound would open up I would get angrier and angrier. “How can they do that? No man in his right mind would want to inflict that kind of punishment on another human being,” I would say to myself. “How can Jesus endure such a merciless unprovoked beating?” I added. I don’t have the answers all I know is they did and he did. But here’s the kicker you and I both know that life has beaten the hell out of us! Sure it wasn’t with a flogging device made of leather and lead balls the instruments used, our beatings was much worse. There were the times when people (sometimes in our own family) turned against us leaving us alone for no reason. There were the times of doubt when our health went sour leaving us seemingly with no future. There were times when we’ve doubted our own worthiness. There were the times when life shouted at us, “Even God don’t care. There were the times when life us the Holy Spirit was just a figment of our imaginations. And now in the midst of a chaotic world that is experiencing unprecedented conflicts of war, poor economy, poverty, and uncertainty the leather straps and the lead balls continue reopen old wounds and open new ones. Life has beaten the hell out of us! And now we are slowly and painfully stumbling toward a cross. And the cross will inflict its own terrible pain on us! And we will begin to wonder is that all there is to life, is there no better news? Because Jesus has gone to the cross before us at a time set aside by God all the beatings the hellish pain inflicted on each of us by life will be replaced by a new kingdom, God’s kingdom. 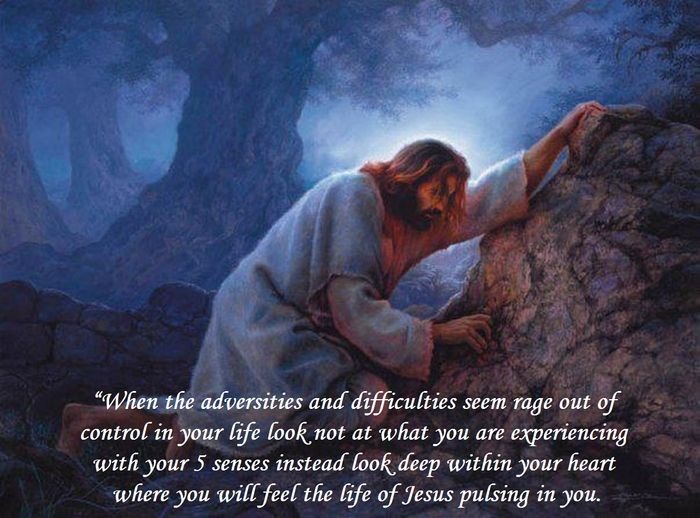 At the hands of Jesus the Holy Spirit will transform our pain into a blessing, a blessing of life, not physical life but the Spiritual Life of the Father himself. And the life the Father gives swells up into his kingdom not only while we are here on earth but his eternal kingdom as well when our physical bodies will no longer support life. We too are beaten and are being beaten. With the encouragement, strength, and power of the Holy Spirit we WILL embrace our cross too. What life attempts to destroy Jesus restores!